As some of you may have noticed from our Facebook page, this is a sad week for us. On Wednesday night, our member John Pope died. He had been ill with cancer and had known it was terminal for many months. 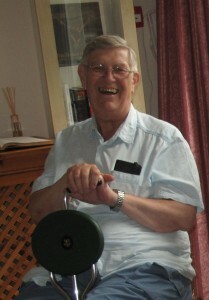 John was raised a Catholic, but spent many years involved with the Church of England, including being on General Synod. He became a member of the Ordinariate a couple of years ago, when his wife, Val was received into full communion with Rome at our Easter Vigil. He will be sorely missed by our group. We ask for your prayers for his soul and for Val and their family at this time. Such a lovely, gentle man. May he rest in peace and rise in glory. « Soul Cake, A Soul Cake!